Since 2000, over 1.5 million Muslims have used the subsidy; since 2008, over 120,000 Indian Muslim every year make use of the subsidy. The Hajj subsidy includes an airfare subsidy as well as assistance to Muslim pilgrims for domestic travel to reach specially designed Haj departure airport terminals, meal, medical care and lodging assistance provided by the Government of India. In fact, Indian government has created separate Haj air terminals for these muslim pilgrims for their convenience at major airports. The average airfare subsidy was about ₹73,526 (US$1,000) per Muslim pilgrim in 2008; while the average non-airfare financial assistance was ₹2,697 (US$38) per pilgrim. The total subsidy provided by the Government of India was US$1,815 per Muslim pilgrim in 2008. In a Central Haj Committee meeting in November 2017, it was decided that Haj subsidy will be completely phased out in 2018 and funds will be utilised on educational programmes especially for girl children of the minority community. On 16 January 2018 Union minister for minority affairs said that the Hajj subsidy has been completely taken off (Rs 700crore) and this amount will be made used for educational purposes of the children belonging to minority. In May 2012, the Supreme Court of India bench, composed of Altamas Kabir and Ranjana Desai, ordered the government to end the practice by 2022. "We direct the Central government to progressively reduce the amount of subsidy so as to completely eliminate it within a period of 10 years from today," said a bench of Justices Aftab Alam and Ranjana P Desai. "The subsidy money may be more profitably used for uplift of the community in education and other indices of social development," said Justice Alam, who wrote the order. The court said it has no authority to speak on the minority community's behalf and that it would be presumptuous to tell the Muslims what was a good or bad religious practice even though it cited Quran to say that haj pilgrimage was mandatory only for those who could afford the expenses for traveling, food and accommodation. The Haj subsidy traces its origins to the British colonial era. In 1932, the British colonial government enacted The Port Haj Committees Act, which provided for government funded Haj Committee and named Bombay and Calcutta as two embarkation points for Haj by Muslims in British India. Along with Muslim Personal Law (Shariat) Application Act of 1937, the Haj Committees Act was one of a series of laws passed by the British colonial government to address Muslim demands in a riot torn, pre-partition South Asia. The colonial government also granted a monopoly for sea-based Haj pilgrimage by South Asian Muslims to Mogul Line ships, owned by the British company Turner Morrison & Co. Ltd. In 1959, Indian government repealed and replaced the 1932 Act, enacting Haj Committee Act, to establish a Committee in the Port of Bombay for assisting Muslim pilgrims to Saudi Arabia, Syria, Iraq, Iran and Jordan and for matters connected therewith. The purpose of this Act was to manage all affairs of pilgrims like disseminating information, to negotiate travel arrangements, arranging guides, helping the needy and to address grievances of pilgrims. Article 16 of the 1959 law also created a taxpayer financed Haj Fund to cover overhead expenses. The Haj subsidy was modified in 1973, when the Indian government abolished sea travel as a means of making the Hajj for two reasons - rising oil prices after formation of OPEC and a ship accident that killed 39 pilgrims in June 1973 during the government managed Haj trip. The government of India replaced the means of travel to Saudi Arabia from ships to aircraft. The government simultaneously increased the subsidy to cover the difference between sea and air fares. Since 1994 the round trip cost to Jeddah, Saudi Arabia has been fixed at ₹12,000 (US$170) per pilgrim, and the government has footed the rest of the bill. In 2007 the government spent ₹47,454 (US$660) per passenger. In the year 2009 the cost was ₹8.26 billion (US$110 million). Ministry of Civil Aviation provides subsidy for air travel to the pilgrims through the Haj Committee of India. 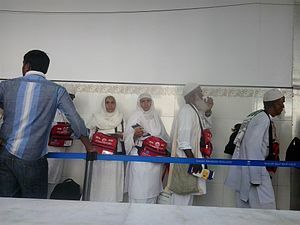 The amount on air travel charged per pilgrim during Haj 2014 was Rs. 35,000/- whereas the actual air fare ranged from Rs. 63,750 to Rs. 1,63,350 depending on the embarkation point in India which were always higher than normal charges of air tickets. For Haj-2015, an amount of Rs. 42,000/- will be charged as airfare from each pilgrim performing Haj through HCOI. The subsidy amount extended was Rs.836.56 crores in 2012 to Rs. 680.03 crores in 2013. In 2014, it has further reduced to Rs. 533 crores. In 2012, the Supreme Court of India ordered that Haj subsidy must end by 2022. The Supreme Court found that Hajj by Indian Muslims is funded to a substantial extent by the Indian Government. The Court ruled that this subsidy is not only unconstitutional but inconsistent with the teachings of Quran. The Court cited Quran verse 97 in Surah 3, Al-e-Imran ordains as under: "In it are manifest signs (for example), the Maqam (place) of Ibrahim (Abraham); whosoever enters it, he attains security. And Hajj (pilgrimage to Makkah) to the House (Ka’bah) is a duty that mankind owes to Allah, those who can afford the expenses (for one’s conveyance, provision and residence); and whoever disbelieves [i.e. denies Hajj (pilgrimage to Makkah), then he is a disbeliever of Allah], then Allah stands not in need of any of the Alamin (mankind, jinn and all that exists)." The Court directed the Central Government to progressively reduce the amount of Haj subsidy and abolish it by 2022. The Court, in its 2012 order, said the Centre should invest that amount in education and other development measures for the minority community. also directed the Indian government to stop providing Hajj subsidies to Muslims identified by central government as very important person (VIP), very very important person (VVIP), and the special dignitaries and eminent persons nominations of 3,000 Muslims per year under so-called Goodwill Delegation to Saudi Arabia. The Centre had informed the Supreme Court that it had decided to restrict Haj pilgrimage at government subsidy to Muslims only as a "once in a lifetime" affair as against the existing policy of "once in five years". In an affidavit filed before the apex court, the government said the new guidelines have been framed to ensure that priority is given to those applicants who have never performed Haj. The apex court was hearing an appeal filed by the Centre challenging a Bombay high court judgement which had directed the Ministry of External Affairs to allow certain private operators to operate the services of 800 of the 11,000 pilgrims earmarked under the VIP quota subsidised by the government. Earlier, the bench had pulled up the Centre's practice of "politicising" the annual Haj pilgrimage by permitting official delegations to accompany the pilgrims, for which the government offers huge subsidy, saying, "It's a bad religious practice." On 27 July 2012, the Supreme Court declined Centre's request to defer till next year its 23 July order down sizing the government's discretionary quota to 300 from the proposed 5,050 seats and had hoped these would be allotted on "reasonable basis". The subsidy had been reduced from Rs. 685 crore in 2011 to Rs 200 crore by 2017. It was stopped by the government from 2018 onwards and will be used instead for education of Muslim girls. Union minister Mukhtar Abbas Naqvi confirmed it had been withdrawn. Considerable criticism has been levelled against this practice, both by Hindu organisations opposed to state funding of private pilgrimage outside India and by Muslim pressure groups. As an example of the latter, Mohib Ahmad contends that even Air India's subsidised fare is higher than competing airlines' ordinary fare. However, the government has continued offering the Haj subsidy despite protests from the Muslim community at large. Syed Shahabuddin claims that Air India's rising costs for travel, and the consequent increases in the Government of India's subsidy, have resulted partly from differences in foreign exchange rates beyond the airline's control. He suggests charter fares should be set at two-thirds of regular IATA fares, but points out that the Haj has higher costs than other charters because two empty flights are required to return the aircraft to India and to position the aircraft in Arabia for the pilgrims' return journey. Shahabuddin maintains that the subsidy ought to be phased out because Hindus view the subsidy as preferential treatment of India's Muslim minority. one of India's most Renowned Islamic Scholars, Dr. Zafarul Islam Khan states that,"Muslims, in general, are not in favour of the Hajj subsidy. We consider the subsidy as a subsidy to Air India and not to the Muslim community." Syed Ahmed Bukhari, the Shahi Imam of Delhi's Jama Masjid mosque, said a decade was far too long for the subsidy to be phased out. "It should be done away with within a year," he told reporters. Salman Khurshid, minister for minority affairs and a member of the Congress party, which heads the coalition government, expressed no surprise about the court's decision, telling reporters that discussions to "roll back the Haj subsidy" had been underway for four years. Asaduddin Owaisi, a member of parliament from the city of Hyderabad said, this amount of subsidy is to simply being a subsidy for Air India. Ticket prices would be far lower, he said yesterday, if Air India's monopoly were broken and pilgrims simply bought their own, unsubsidised tickets on other airlines. Other Muslim leaders have argued that the Hajj subsidy is "un-Islamic" and that Hajj money should be invested in education and health instead. Maulana Mahmood A. Madani, a member of the Rajya Sabha and general secretary of the Jamiat-e-Ulema-e-Hind, declared that the Hajj subsidy is a technical violation of Islamic Sharia, since the Koran declares that Hajj should be performed by Muslims using their own resources. Influential Muslim lobbies in India have regularly insisted that the Hajj subsidy should be phased out as it is UnIslamic. Praveen Togadia of Vishwa Hindu Parishad has argued that the government sponsored Haj subsidy is provided from taxes of Hindus to pay for Muslim religious pilgrimages, and demanded that it be abolished or similar grants be extended to Hindus. ^ Vij, Shivam (28 February 2011). "The myth of India's Hajj subsidy: Muhammad Farooq". Kafila. Retrieved 11 September 2016. ^ "Muslim MPs demand withdrawal of subsidy on Haj travel". 7 March 2011. Retrieved 11 September 2016. ^ "Haj subsidy to be phased out next year". ^ "Women over 45 years no longer need mehram to go on Haj". ^ "SC STRIKES DOWN HAJ SUBSIDY". ^ a b c Achin, Kurt (10 May 2012). "India's Supreme Court Orders End to Hajj Subsidies". Voice of America. Retrieved 10 May 2012. ^ a b "Abolish haj subsidy in 10 years: Supreme Court to government - The Times of India". M.timesofindia.com. 9 May 2012. Retrieved 12 September 2016. ^ "Muslim leaders back cutting Haj subsidy". Hindustan Times. 11 April 2010. Archived from the original on 21 January 2012. Retrieved 8 May 2012. ^ "India: Hajj applications falling every year". Geo TV, Pakistan. Retrieved 8 May 2012. ^ George, Daniel P. (17 June 2011). "Haj may cost less; new airline to carry pilgrims". The Times of India. Retrieved 10 May 2012. ^ "How much Subsidy does the Government extend to Haj Pilgrims?". 12 August 2015. ^ Ranjan, Amitav (13 October 2010). "Haj subsidy cuts start soon". The India Express. Retrieved 14 July 2011. ^ "SC says no to Centre's plea to relax Haj pilgrims quota order". The Times Of India. 27 July 2012. ^ Mohib Ahmad, "Haj Subsidy, Anyone?" Archived 25 February 2009 at the Wayback Machine, Indian Muslims blog, 18 January 2006. Retrieved 25 June 2009. ^ a b Syed Shahabuddin, "Haj subsidy is a fact and must go eventually", The Milli Gazette, 15 September 2002. Retrieved 26 June 2009. ^ "Muslim support for end of subsidies for India's Haj pilgrims - The National". ^ "'Haj subsidy unIslamic, use that money on our education, health'". The Indian Express. 17 November 2006. Retrieved 10 May 2012. ^ "Muslim leaders back cutting Haj subsidy". Hindustan Times. 11 April 2010. Archived from the original on 21 January 2012. Retrieved 10 May 2012. ^ "Why can't Hindus get subsidies like Muslims, asks Praveen Togadia". Economic Times. 26 March 2017. Retrieved 3 November 2017.